It all started on a lovely sunny day in May 2009 at a fayre. 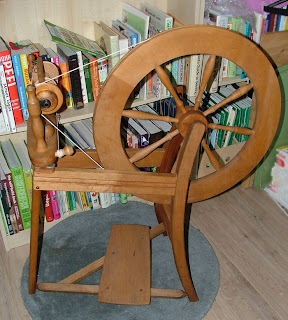 I'd only been thinking over the previous few weeks or so that one day I would love to have a go at spinning wool. Actually, it started a few years before that because we already had sheep's wool in our house, used mainly by my husband who started making peg loom rugs with washed wool. We were shocked back then at just how cheaply fleeces were priced or, often, even just discarded. These fleeces were from organically raised sheep too. I had also been using some of the washed fleece to stuff small toys, knitted Christmas decorations and a doll I made for my daughter. So anyway, on arrival at the fayre we saw that there was a spinning and weaving demonstration stall so we started to walk over to have a look, but before we even got there I found myself drawn to a stall selling second hand farming implements, etc, And there, right in front of us was a spinning wheel. The lady whose stall it was spoke of having more than one wheel so it was time to sell this one. 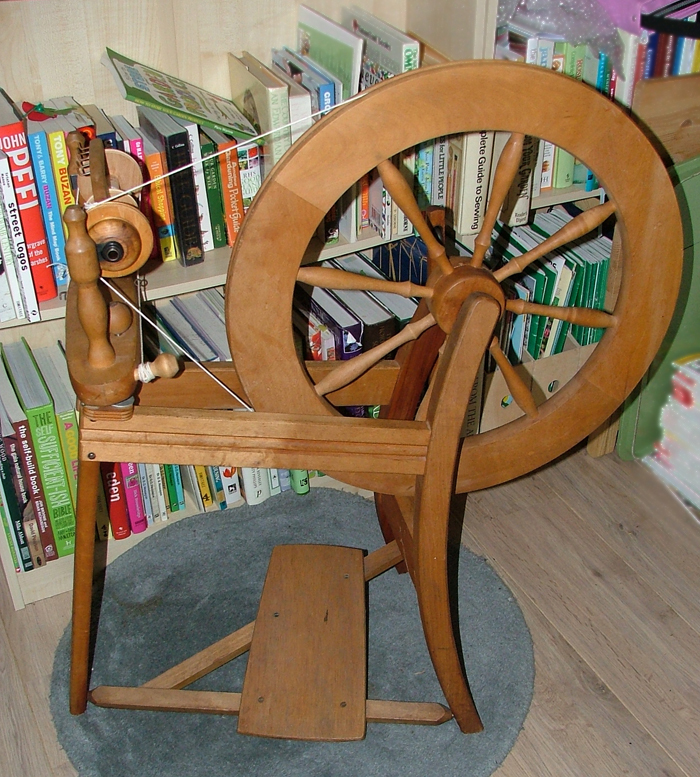 It was funny because I had just put in a reservation request at the library the week before for some books on spinning, and was thinking of purchasing or making a drop spindle, and now here I was standing in front of a very reasonable priced, second hand spinning wheel. Of course, I had no idea what I was doing, and I didn't have any carders to prepare the wool properly, but, well, you're not going to let things like that stop you are you? I bought the wheel, obviously, and started trawling the internet for advice on how to use it. It was in the process of this search that I came across a "Woolly Weekend" at a local farm and the next thing I knew I was talking to the ladies from the Guild demonstrating in one of the barns. 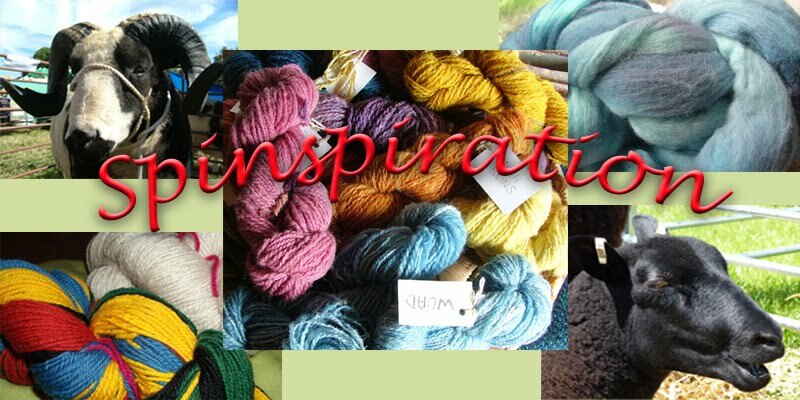 I remember being really inspired meeting one lady as she was making yarn even though she hadn't been spinning very long and marvelling at other guild members using drop spindles, weaving and finger knitting. 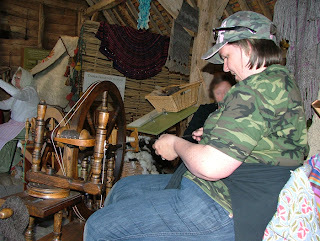 It was meeting another lady spinning on her wheel that made the biggest impression on me though. 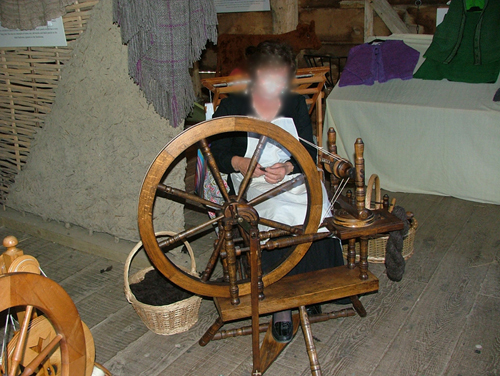 Within minutes of meeting her, she had shown me the processed of carding and spinning, and how the yarn plies, then offered to let me have a go on her wheel. I was thrilled to take her up on her offer. I took to it quite well, "a natural to spinning" she said. Although I felt I had little control of what was going on it was great to have a go. 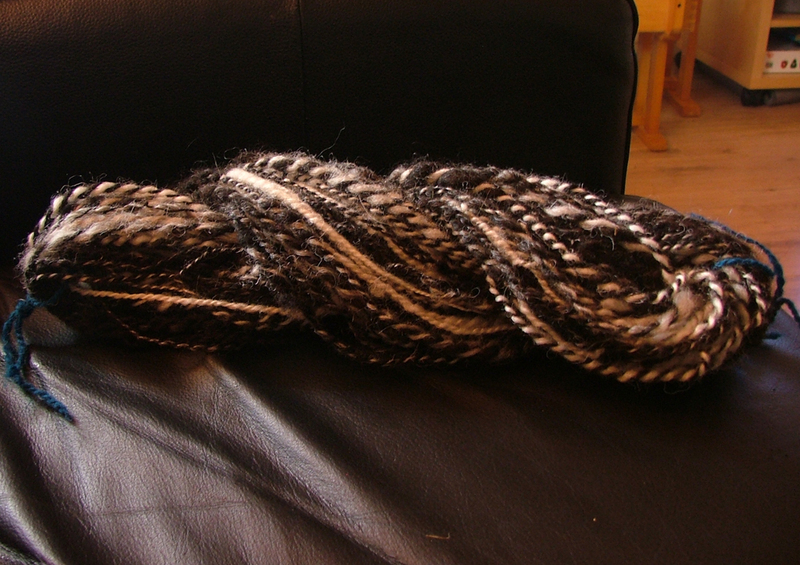 It gave me a real appreciation of the craft and the people who spin wool so well. I was given a copy of the Guild leaflet and she encouraged me to go along to the Guild meetings. Me having a go on her very expensive wheel! Around this time I also got in touch with the Secretary of the Guild who told me about another member, who hosts a spinning class on a Monday evening. My details were passed on to her and she got in touch with me. I went to my first class with her a few days later. My first lesson was great (as they all were afterwards too) - she explained all the parts of the wheel and how they work before going on to the various ways that wool is prepared and then it was time to have a go at spinning. By the end of the evening I had spun wool on my bobbin of various thickness and felt encouraged that I could pick it up over time. That week I also spent a day with another tutor which I had pre-arranged, a little treat for me, so went along to that with a little knowledge gained from my first class. Hilary (the tutor) had a large Kacobs fleece which she laid out and explained the different parts, and how to sort the fleece. 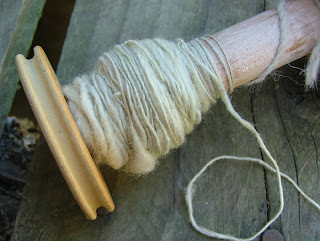 We did some sorting, carding, some flick carding and combing and lots of spinning, plying and washing. 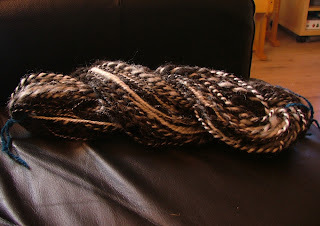 I had had a great day again and felt I had improved over the day, taking home 2 skeins of washed plied yarn home to dry. I was also able to pick up a 2nd hand pair of carders there, so now I could practice more at home too. I went to the Guild meeting in June and met lots of lovely Guild members, and learnt about Dorset buttons. There were also sheep's fleeces on sale and I went home with a Dorset hon fleece to go with a Jacobs fleece my husband picked up for me that day where he and my daughter had spent the day. At my second Guild meeting I found myself volunteering to become the newsletter editor at the Guild AGM as the previous editor was stepping down. I thought I could spare some time to have a go at this, could use computers and thought it would be a great way to learn more myself and get to know Guild members better. I have progressed over the last 2 years, first mastering the short draw method (push and pull), then long draw, lying two or more bobbins together and Navajo plying from a single bobbin. I have also picked up other bist of equipment, often from the sales table, and learnt other crafts. Other equipment has been made my myself or my family, you don't always need to buy things as handmade will work just as well. Most of my spinning has been using wool in its raw natural state rather than bought commercial roving or tops. There is something very pleasurable about taking wool sheared from the sheep full of lanolin, dirty and smelling of its owner and going through the whole process to create a yarn. I've skirted fleeces, sorted and picked them; gently washed, dried, carded and spun the wool into a yarn and then used it to knit or weave. It doesn't get much better than that. I have collected many fleeces (I hear my husband laughing uncontrollably at this point!) of different British breeds and it's amaing how differently they spin. More on the different breeds (fleece, not sheep) I have another day.